ROUGHLY a third of the energy contained in fuel is converted to “power” in an internal-combustion engine. The other two-thirds are lost to the cooling system and along the exhaust pipe (ignoring frictional and other losses). To put engine cooling into perspective, a normal household kettle is rated at about 1 kW (electric power). This means that a Bugatti Veyron Super Sport at full power (883 kW) loses about the same amount of energy to the cooling system as is generated by 883 kettles. Let’s investigate what happens to the heat energy. The heat energy is realised from the fuel during the engine’s combustion cycle where the chemical energy is converted to heat. One litre of fuel contains 34 MJ of energy (or 46 MJ per kg). Therefore, if for example a vehicle consumes 6,0 litres/100 km at a steady speed of 100 km/h, 0,00671 litres are consumed per second. This equates to roughly 57 kW of potential chemical energy being fed through the engine. Using the thirds approximation, around 19 kW is dispersed through the cooling system. How is the Heat Dissipated? In a four-stroke engine, the power stroke (where combustion takes place) lasts for 180 degrees of the crankshaft’s rotation. The peak gas temperatures can reach up to 2 500° Celsius in the combustion chamber, but the average temperature, however, is much lower owing to the increase in volume as the piston moves away from top-dead centre (TDC). The combustion heat is mostly transferred to the metal areas (such as the pistons, cylinder walls and valves) by means of turbulent convection. The rate of heat transfer depends on the gas temperature, surface area and temperature of the metal surfaces, as well as the time for the process to take place. From there, the heat energy is conducted by means of the metal areas to the cooling system (water jackets in a water-cooled engine and metal fins in an air-cooled engine). The remaining heat energy escapes past the exhaust valves and through the exhaust system during the exhaust stroke of the engine (piston moving towards TDC after combustion). Direct air-cooling involves removing heat from the engine’s cylinders and heads by means of convection. The metal fins fitted to air-cooled engines essentially increase the surface area in contact with the ambient air to increase the heat-transfer rate. Many air-cooled engines will also employ an oil cooler in which the heat from the oil is also transferred to the atmosphere. Approximately 10% of an engine’s cooling can take place through oil-cooling alone. In many cases, a fan is needed to increase the airflow over the engine fins when natural convection is not enough. An air-cooled Porsche was an example of such an application. This is less of an issue in motorcycle or aviation applications because such engines are subjected to direct airflow at speed. The main reason why air-cooling has lost favour in modern applications is that the heat capacity (specific heat) of air is approximately four times less than water per kilogram. With increasing engine outputs, air-cooling alone is incapable of removing enough heat to prevent the engine from overheating. Another reason is that, with air-cooling, precise control of engine temperature is difficult to achieve and this negatively influences the emissions and performance of engines equipped with the technology. A water-cooled engine is also air-cooled because the final means of dispersing heat is mostly via a water-to-air radiator. Water-cooling refers to water as the working fluid in a closed cooling circuit. This circuit consists of a thermostat to regulate the water flow, water pump to circulate the water in the circuit, and a radiator (with cooling fan). The cooling circuit consists of rubber piping between the radiator and engine and then continues as water galleries to the cylinders and heads of an engine. These water jackets are placed in optimal regions to remove the combustion heat efficiently from the metal components. This closed circuit is pressurised at the operating temperature to increase the boiling point of water. Anti-freeze is added to the water to further increase the thermal properties of the working fluid, to prevent corrosion to engine components and provide lubrication to the water pump (see Antifreeze dangers below). Cooling simulation engineers spend countless hours modelling the entire cooling circuits of powerplants and that includes the airflows over radiators and through the engine bays. The cooling performance is influenced by the ambient temperature, driving speed, resistance to airflow through the radiator and in the engine compartment, as well as the area and efficiency of the radiator and the specification of the fan. The size and placement of water jackets can be experimented with as well as the flow rate of the working fluid. Once the optimal hardware solution is found, the engineers will spend their time calibrating warm-up strategies to lessen emissions during cold starting. These strategies are made possible by electronically controlled water pumps and thermostats and valves that can close coolant galleries when required. 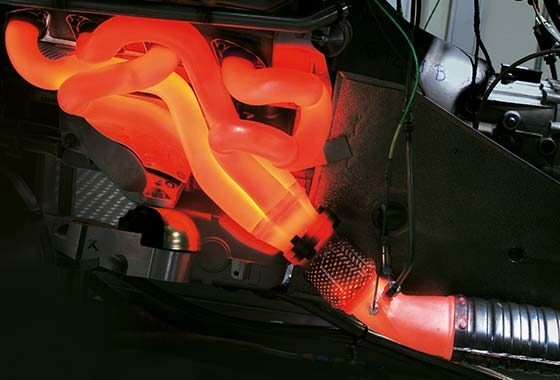 A lot of potential energy in the fuel is wasted as heat energy, either to the cooling system or through the exhaust. Turbocharging has managed to recover some of the lost energy leaving the exhaust system and combined with downsizing, led to more efficient engines. The next step will be to recoup the wasted heat energy and use it for either propulsion or running other power-consuming functions. Although many such systems have been experimented with, a solution has not yet made it into production owing to cost, complexity or added mass. A more realistic option is to recover some of a turbocharger’s energy when it has more energy than it needs (normally bypassed via the wastegate) to produce a boost set point. Formula One will introduce such a system known as Energy Recovery System – Heat (ERS-H). This electric motor/generator unit connected to the shaft running between the turbine and compressor of a turbocharger will not only recover extra heat energy, but will also be able to eliminate turbo lag by spinning up the turbo when the unit is in its motoring mode. Expect to see this technology filter down to production vehicles in the near future. Most manufacturers specify their own formulae of antifreeze (primary agents include ethylene glycol, corrosion inhibitors and other additives) that have been extensively tested and are compatible with the materials of the block, head, water pump and water hoses. The antifreeze should be added at the correct volume percentage. It is also not ideal to use municipal water in your vehicle’s radiator because it may contain constituents that could form deposits in the cooling system; rather used distilled water. As each brand of antifreeze comprises different additives, it can be dangerous to mix brands as the new solution may lose the corrosion resistance or even accelerate corrosion. There are some waterless coolants on the market today that claim to beat the performance of a water-antifreeze mixture in most departments; www.evanscooling.co.za has more information.